Posted on October 24, 2018 by Andy Higgs in Denmark, Europe, Features, Norway, Places, Sweden. It’s not only nearly Christmas, it’s also nearly that other time of the year again. The end of the year, to be precise. Time for reflection on the last 365 days and to make resolutions for the next 365. And then there’s New Year’s Eve – and for me the London celebrations at Trafalgar Square are but a dim memory. Having celebrated Christmas with their families, Swedes like to enjoy New Year’s Eve with friends. Dinner can be an ostentatious affair with the hosts laying out their finest tableware, dressing in their best clothes and serving a lavish meal. Discussion revolves around the year gone by and the year to come. At midnight everyone gathers to watch a live television broadcast from the Skansen Open-air museum in Stockholm, where the bells chime and a New Year verse is read to the nation (curiously a Swedish translation of “Ring out wild bells” by the English poet Tennyson). The show also includes choir music and live performances and is followed by a spectacular fireworks display. It’s a cosy way to end the year but many prefer the bracing fresh air and meet in public places at midnight to let off their own rockets. Champagne is opened, toasts are made and as in many other countries resolutions for the New Year are proclaimed as the night sky comes alive with colourful fireworks. New Year’s Eve in Denmark is a time for celebration and optimism, for bidding goodbye to the past year and leaving any problems behind. Most people plan dinner with close friends and family and traditional dishes include boiled cod and stewed kale, with marzipan ring cakes to follow. 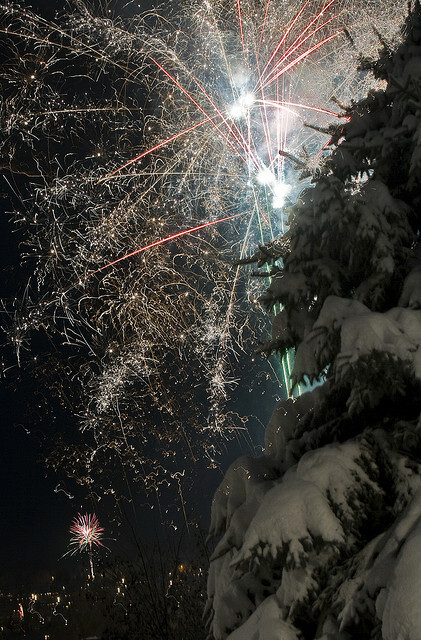 Pretty much every town and city in Denmark throws their biggest party on New Year’s Eve. Most of these parties begin early in the evening with the excitement growing as midnight approaches. Eating, drinking and dancing are the priorities. Hotels and restaurants offer special dishes for the evening and also present music shows and live performances. Many Danes are glued to their televisions to catch the Queen’s New Year’s Eve speech. When the clock strikes midnight, fireworks light up the sky. Many people set off their own but the display in Copenhagen’s Tivoli Gardens is considered the best. Indeed the New Year’s Eve show is the culmination of five days of fireworks in Tivoli Gardens which starts two days after Christmas. 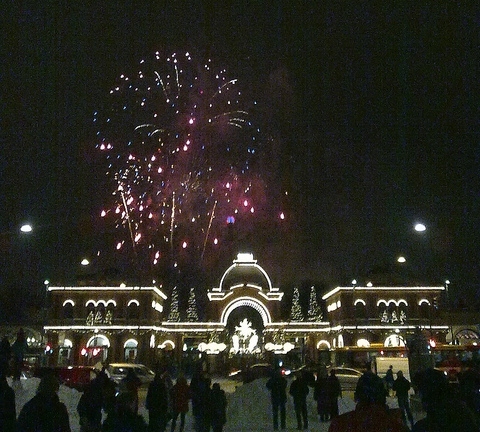 Fireworks are the main feature of the Norwegian New Years’s celebrations. Often a public display takes place in the early evening so that the youngest children can also enjoy the spectacle. Warm cocoa helps to keep the crowds warm and no child is without a sparkler. Later in the evening the adults get their turn; dinner is generally eaten with friends and family and often consists of turkey or fish. Later the group ventures into the winter night shortly before the clock strikes twelve. Restrictions in recent years have (sensibly enough) curtailed the dangerous Norwegian habit of letting off rockets wherever they find themselves when midnight arrives, which used to make the otherwise orderly streets seem like an anarchic war zone for one day a year. Even tougher laws are under discussion and most city dwellers now enjoy the public displays instead. Those residing in less built-up areas set off a few fireworks of their own. Fine wine or champagne is an important part of the ritual to toast the arrival of the New Year. And what will you be up to then? Well, this year is a little different. We’re in Thailand and will be celebrating on the beach in Krabi. Needless to say you’ll get to hear all about it, but until then, have a great night however you ring in 2014!